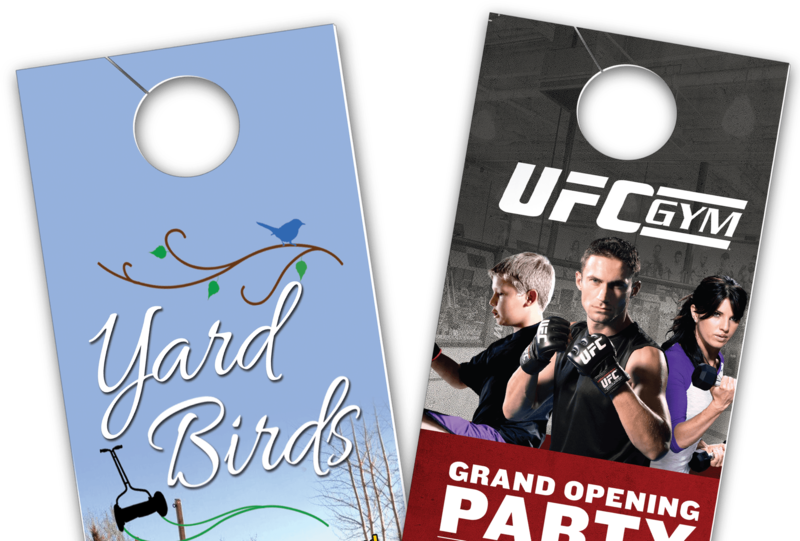 Door hanger printing is one of the easiest and cheapest forms of residential advertising. Whether you plan on walking the neighborhood or hiring a delivery service, your message is sure to gain attention for advertising political campaigns, seminars, events, menus or any local activity. Our easy to use door hanger templates make it a snap to design your door hangers without hassling with bleeds, safe zone and trim area. We also have a basic online design option for door hangers, with more templates to choose from coming soon! Mount door hangers on the homes of intended target audience. If recipients live in an apartment complex or other densely populated areas, neighbors may see the door hangers which could extend a print marketing campaign even further. The key is finding locations that would attract industry-relevant consumers. Just Upload Your Camera Ready Files….If you need design help, try our online door hanger design tool. Our easy to use templates make it a snap to design without hassling with bleeds, safe zone and trim area. I have used PrintingCenterUSA.com many, many times for doorhangers and flyers and each time I have been pleased with outcome. The people I deal with to upload and approve my files have always been very nice and quick to respond to my emails and the product we receive is always the highest quality.